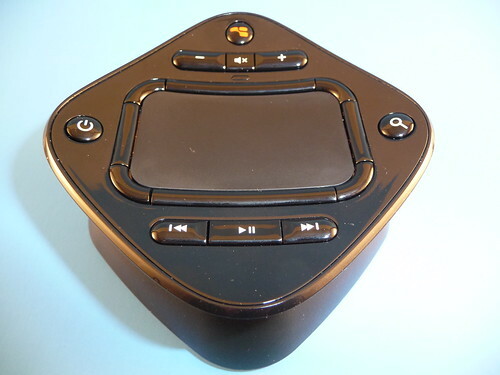 Charging Station - A simple charging “dock” where you’ll sit the Navigator remote on when not using it charges the device. This can be plugged into the USB port of your computer (separately from the USB receiver) or plug the USB cord into the AC Charger. USB Cable – One 6-foot USB 2.0 cable is packaged with the Navigator to connect between the charging station and either the AC Charger or the computer. I should mention here that I think it was a great decision to keep the charging station separate from the USB receiver. I say this because sometimes it really makes sense to have the charging station close to the couch – instead of close to the computer. 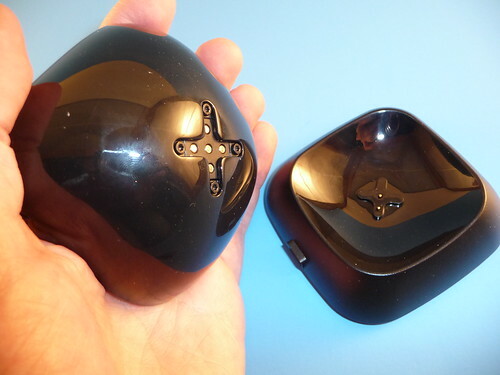 The GlideTV Navigator remote is fairly small at 3.5 inches wide (both ways) and a depth of about 1 inch in the center. 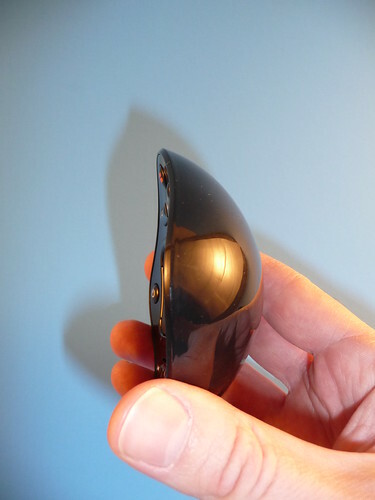 It weighs a very light 3.2 ounces and is curved to form an curved form factor that fits your hand quite nicely. 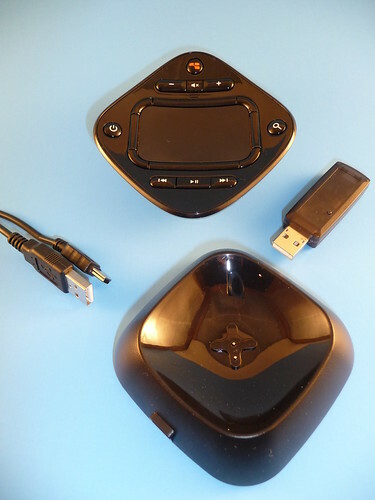 It’s designed with a glossy-black, hard plastic look that seems very solid. The concept is to hold this device in your hand and use your thumb to control everything. At the center-top of the device is the clickable 2” X 1.25” touchpad that will remind you of the touchpad on your laptop. First, there are eight “directional” buttons that surround the touchpad. These buttons serve as both directional buttons as well as multi-function buttons to do things like close-application, escape, backspace, mouse clicks, channel-up/down, live TV etc. Learning these different purposes of the same keys does take some getting used to and makes the learning curve a bit more difficult – especially for the other family members of the house. On the four corners of the device you’ll find a search button to the far-right and a power button to the far left. On the upper section is a “GlideTV” button that opens up the custom GlideTV UI, a volume mute toggle button, a volume-down and volume-up button. On the lower section is a play/pause/stop toggle button, a skip-left button and skip-right button. Beyond those main buttons you’ll find a designated GlideTV button that fires up their custom software, a power button (it controls the PC power), volume control, search button (opens up GlideTV’s search which can be designated to Hulu, Google, etc) and media player controls (play, pause, etc). The 8 surrounding buttons each do something different in their respective applications, so a little trial and error will help you figure that out. So fewer buttons than a typical remote control means they’ve attempted to simplify the inputs right? So what common remote control buttons are missing? And if you’re a full-fledged HTPC user you know there are many other buttons you might want. The GlideTV Navigator is “keeping it simple” when it comes to hard-buttons on the device, but it does get a bit more complicated when you want to do something beyond the ordinary. For example, lets say you want to switch applications such as going from iTunes to MediaCenter (like function-tab on a standard keyboard) in this case you must remember to hit the function key (the directional key on the south-west region of the touchpad. You get the idea – nearly every function is covered but it requires that you learn which combination of buttons do what function. 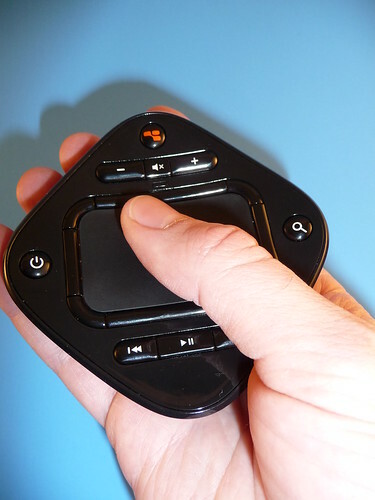 Absolute Mode – here the touchpad is meant to be a “representation” of your computer or TV display. Touching a portion of the touchpad is like “pointing” to a place on your screen: Tap the top-right of your touchpad and you “place” the cursor on the top-right of your screen and so forth. 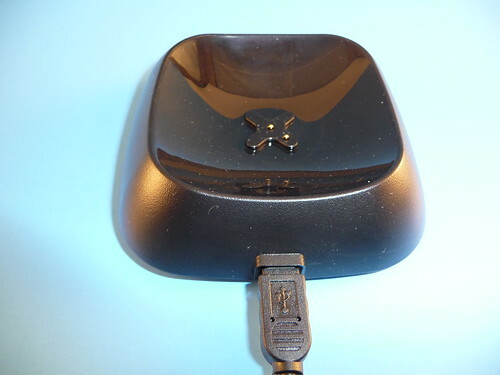 The GlideTV Navigator uses 2.4GHz wireless RF and according to GlideTV will work up to 30ft in an open space. I tested mostly within 10-15 feet although I did push it to 20 feet and still had no problems with responsiveness. I didn’t do a complete testing of the battery life, but did keep the GlideTV Navigator away from the charging cradle for multiple days at a time without charging and it seemed to hold its charge well. The GlideTV goes into standby mode after approximately 10 seconds of inactivity and it automatically powers off after about an hour. It fits nicely into the charging cradle and I never had a problem with the charging contacts not meeting (and therefore not charging) like I have with multiple Logitech Harmony 880 remotes. Setup was very easy. Charge the remote fully the first time, connect the USB receiver into the computer you’ll be remote controlling and then select the operating system you’ll be using – its set as Windows out of the box but you can easily change it to Mac or PS3 with a switch in profiles. After that, you’ll need to determine if you want the touchpad to be in Absolute mode or Relative Mode. Absolute Mode places the mouse cursor in correspondence with where you place your finger on the touch pad. So if you touch the top left corner of the touch pad the mouse will appear there. Personally, I prefer Relative Mode since this is more analogous to my laptop and as I discovered much easier to use out of the box. My remote seemed to lose it’s connection with the USB receiver one time during testing. Fixing it was a simple re-pairing process described on their website. Because of this stumble I delayed the review to be sure it wouldn’t be a recurring problem. I’m happy to report that this seemed to be an anomaly as it hasn’t happened again since and I’ve been testing it for many weeks. 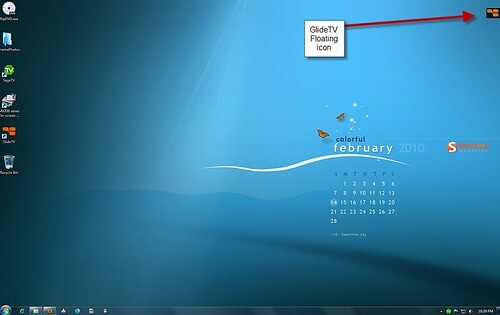 You really don’t even have to be a HTPC user to enjoy the GlideTV Navigator. That’s because they include a nice, downloadable GlideTV user interface software that makes it easy to navigate your favorite websites and applications. It also makes web searches relatively easy as well. To execute the GlideTV UI you simply press the “GlideTV” button at the top of the remote. 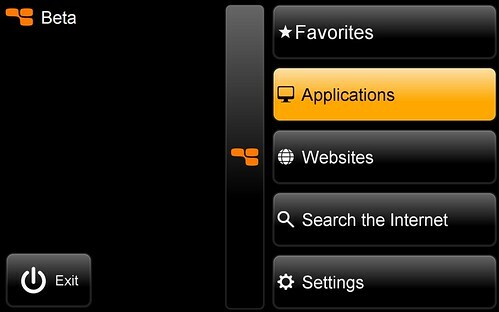 Applications – All of your favorite, installed media applications should automatically appear on this menu item. 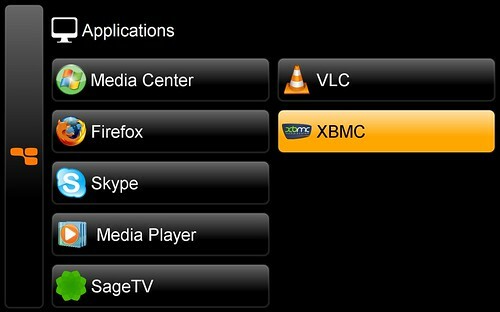 For me I see MediaCenter, Firefox, Skype, SageTV, XBMC etc. Search the Internet – A great web-search app designed with the 10-foot interface in mind. When you select this an on-screen keyboard appears for you to “type” your search using the GlideTV Navigator. Obviously, without a keyboard this isn’t as easy as typing the letters, but you can “hunt-&-peck” with the mouse on the virtual keyboard and it uses predictive input so that it tries to complete the word based on what you’ve typed so far. This works pretty well actually. Settings – this is where you can change many of the settings for the UI app. 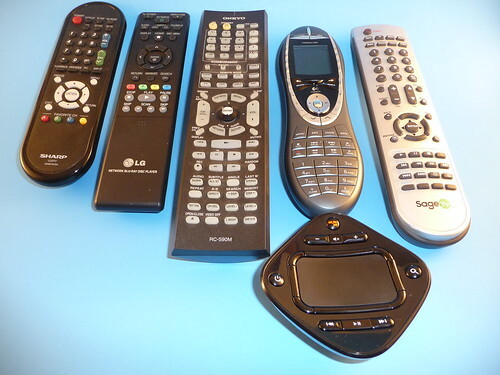 If you’ve ever used a remote control that has a touchpad on it you likely know that the touchpad is often the weak-link in remotes of this kind. I’ve found the Logitech DiNovo Mini touchpad to be somewhat unresponsive at times and this GlideTV touchpad is just about perfect in comparison. Attractive Design – it’s sleek looking and in my opinion, fits in nicely in the livingroom or anywhere you have a TV or computer setup. You’re likely to get asked the question “what is that?” from visitors so prepare for that. Fits nicely in your hand – it’s definitely a change from what your used to, but it’s almost natural to use this as a mouse as it just fits perfectly in your hand. Range is very good. I was able to test to 20 feet from the receiver with no problem. Works as a super-powered mouse that works from the couch – that alone is a very nice feature for those wanting to control their computer from across the room. Learning curve – for my household the learning curve was pretty steep. Basic navigation for things such as up, down, right, left, play etc all were no-brainers, but when the user needs to go-back a screen or stop playback instead of pause it required a little explanation and retraining. Not a deal-stopper by any means but the ability to use all of the remotes functionality requires someone willing to take the time to learn the functions. I recommend you do read the manual for this one – you’ll miss out if you don’t. If you go in thinking this device is going to be like your Logitech Harmony or even a Microsoft MediaCenter remote you might be disappointed. 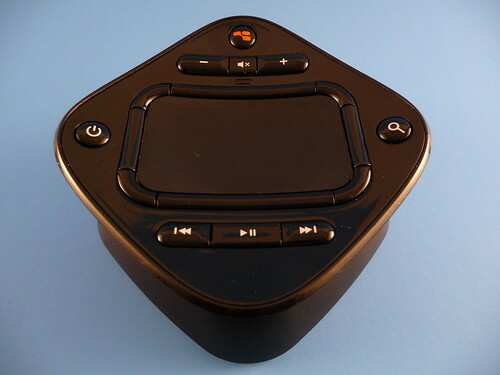 If you understand the GlideTV Navigator’s purpose is to help you easily navigate your HTPC by melding a little remote control & a little computer mouse into a single device you’re going to love this device. In a very simple way, the GlideTV Navigator makes browsing the web and the many web apps as easy as possible with a single 10-foot interface. And it does a good job at controlling your Home Theater PC as well. It takes some adjustment and it’s likely not for everyone, but I see this remote as a great solution for many who are looking for a better way to control their HTPC with the myriad of new web-centric applications available today. The GlideTV Navigator is available for purchase at the GlideTV Website or at Amazon (affiliate) – both for $149 plus shipping. Thanks to the folks at GlideTV for providing the review unit!